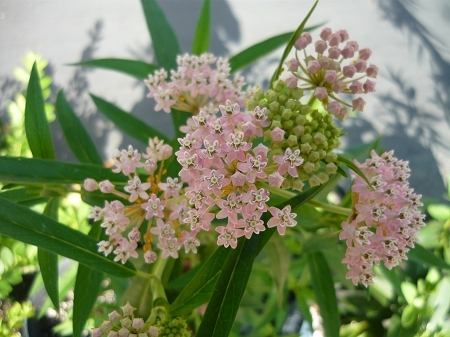 Swamp Milkweed (Asclepias Incarnata) - Important Monarch nectar and host plant. Native to North America. Will grow to a height of 2' - 3' and produces clusters of pale pink flowers blooming over a long time period. Full sun to partial shade, Perennial zones 3a-8b. Milkweed are poisonous if ingested. Live plant in 3 inch container. Like all plants from Colonial Creek this one arrived in good condition. I've had it now for about two months. It grows more slowly than Tropical but it is doing nicely in a pot. I like the fact that it is native to my area.